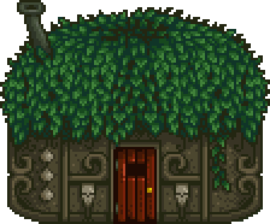 The Witch's Hut is found in the Witch's Swamp, and becomes accessible after completing the Dark Talisman Quest. Inside the Witch's Hut are three shrines, the Wizard's missing Magic Ink (on a table in a purple bottle), and a red teleportation rune on the ground. Returning the Magic Ink to the Wizard unlocks four "magic" buildings for The Farm. Stepping on the rune will teleport the player directly to the Wizard's Tower basement room. Once the player has gained 4 hearts of friendship with the Wizard, the teleportation runes located in the Witch's Hut and Wizard's Tower basement can be used at anytime to teleport between the two locations. Prior to earning 4 hearts, the player will be teleported to the Wizard's basement from the Witch's Hut, but will not be able to return. Dark Shrine of Night Terrors The ancient magi-seal of protection will be lifted, allowing monsters to appear on your farm at night. 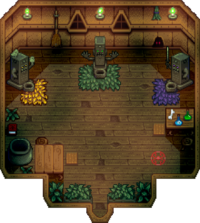 The questline to access the Witch's Hut involves two quests, which become available after completing the Community Center Bundles or the Joja Community Development Form. The player can trigger a cut scene at the Railroad, where the Wizard will request they find a Dark Talisman, which can be found in a chest within the Mutant Bug Lair. The Mutant Bug Lair can be accessed by speaking to Krobus, who will reveal the entrance in the Sewers. After obtaining the Talisman, bring it back to the Railroad area and place it on the artifact blocking the cave. Inside the cave is a teleportation rune which leads to the Witch's Swamp. Once inside the Witch's Swamp, the Witch's Henchman will be blocking the way to the Witch's Hut. He will only allow the player to pass if he is given Void Mayonnaise, which also completes the quest Goblin Problem. Recover the Magic Ink inside the Witch's Hut, then bring the ink back to the Wizard, who will unlock the four Wizard buildings for The Farm. Dark Talisman The Wizard asked me to retrieve the magic ink from his ex-wife's house... but to gain access I'll need a dark talisman. Enter the sewer and ask Krobus about the dark talisman. 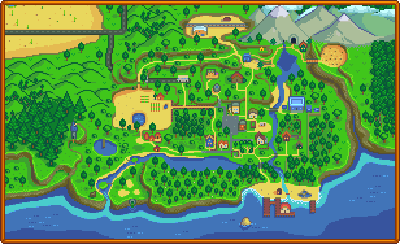 Enter the Railroad area after completing the Community Center Bundles or the Joja Community Development Form. Speak to Krobus to gain entrance to the Mutant Bug Lair, then retrieve the Dark Talisman. Return to the Railroad area and place the Dark Talisman on the artifact blocking the cave. Goblin Problem There's a goblin blocking the path to the Witch's hut. There must be some way to get him to move... Perhaps I should seek out more information on Goblins. Completing the quest Dark Talisman Speak to the Witch's Henchman in the Witch's Swamp, and give him a Void Mayonnaise to gain entrance to the Witch's Hut. Find the Magic Ink and return it to the Wizard. See Dark Talisman and Goblin Problem Video. This page was last modified on 8 November 2018, at 12:19.